I was looking at the playoff picture for this year and was struck by something interesting: this might be the freshest playoff picture we’ve had in years. I’m not really sure what made me think of that. I think I was just reflecting on how odd it was that the Yankees and Red Sox and Phillies and Braves and Tigers and Cardinals were all of out of or falling out of contention a few weeks ago. Since then, the Cardinals have come roaring back into first place, but I still thought it might be worth looking at somewhat analytically. It was a pretty simple process. I simply looked at the teams currently in place for a playoff spot, then looked at what year they last won the World Series. Next, I repeated this for each year of the wild card era. 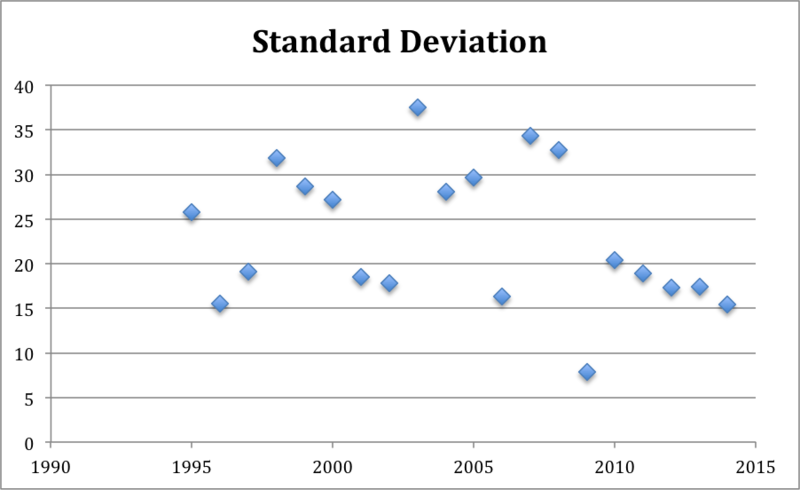 I realize that this method isn’t perfect, but it’s a quick and easy way to look at it, and since the number of teams who win the World Series each year has remained more constant than the number of teams in the playoffs to begin with, this method seemed more stable from year-to-year. Overall, that’s a pretty balanced group. With the exceptions of St. Louis and San Francisco, every team is at least a decade from their last World Series win. Only them and the Angels have one in the last two decades. And should Seattle (debuted in 1977) or Pittsburgh (1979) find their ways into October, this could become an even bigger streak-breaker year. This looks like a surprisingly average year. There are a few odd years in recent memory to look at, though. For example, 2009, which featured the Yankees, Twins, Angels, Rays (debuted in 1998, remember), Phillies, Cardinals, Dodgers, and Rockies, was rather short on long-term suffering. And what was that spike in 1998 from? Well, that postseason featured a nice mix of championless expansion teams (the Rangers, Astros, and Padres) and curses (Cubs, Red Sox, and Indians). However, the World Series of course wound up being the Yankees (2 year drought) and Braves (3 years), because the Baseball Gods apparently have a cruel sense of humor. It’s worth noting that not all of these averages are created equal, though. We’re dealing with small sample sizes here. Take 2007, for instance, which featured the Red Sox (2004 at the start of the 2007 playoffs), Angels (2002), and Yankees (2000) in the AL, and the Diamondbacks (2001), Phillies (1980) and Rockies (debuted 1993) in the NL. With half the teams winning in the past seven years, how could 2007 manage an average so in line with the rest of the years? Well, mostly because the Cubs (1908) and Indians (1948) helped make up for it. It seems unfair to compare 2014 to that unbalanced group. What if I used median instead to make outliers like the Cubs stand out less? What would that look like? That seems to line up more with reality. 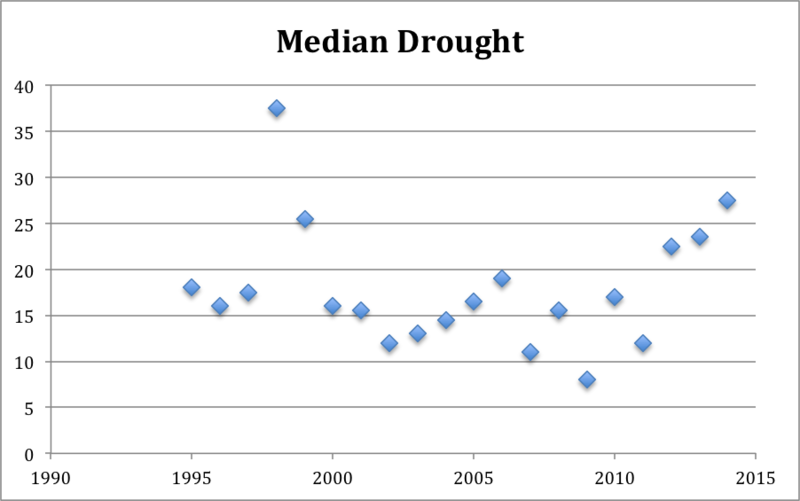 By the median drought, this season would fall only behind that fabled 1998 season. While this batch doesn’t have a legendary streak to bump it up, it’s still a pretty well-rounded group. What’s more, it pretty much has this distinction locked-up. The Yankees would need to take the second AL Wild Card, breaking a tie with the Indians and passing both the Tigers and Mariners, in addition to the Braves taking over the second NL one from the Brewers. It would be much easier for the median to increase, given that teams like the Mariners (founded 1977), Indians (1948), and Pirates (1979) are still in the hunt. And heck, the Braves are even two decades from their last win at this point, which still beats two of the teams set up to go from the NL. There are plenty of ways this could go in the last month that could only make this more notable. One last thing, going off the “well-rounded” thought from earlier. That wasn’t a joke. This potential 2014 group would be the second-tightest bunched in the wild card era. The only year more closely-bunched is 2009, which isn’t exactly in the same class as 2014. It featured the Yankees (2000), Twins (1991), Angels (2002), Red Sox (2007), Phillies (2008), Cardinals (2006), Dodgers (1988), and Rockies (1993 debut). 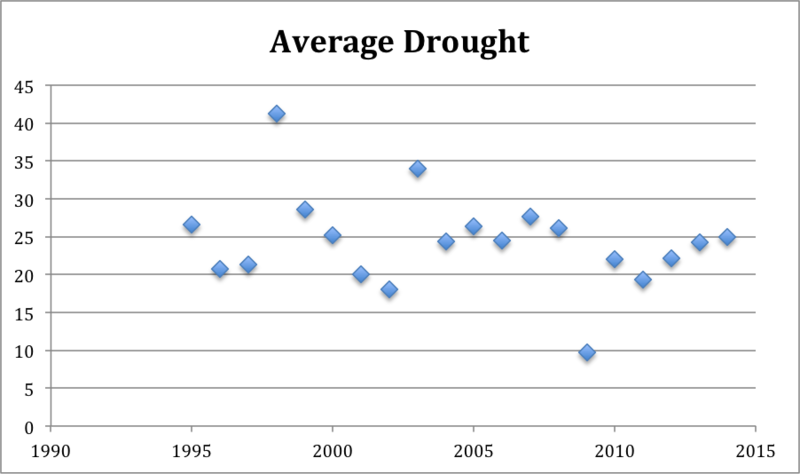 Think about that for a second; the Yankees were in the upper half of longest droughts from that group. That was also the year with the lowest median, at only 8 years. That comparison only makes this year more interesting, given the relative lack of recent winners in the 2014 group (which would make sense, recent winners making the playoffs again). We managed to not only get a cluster of droughts, but a cluster of similarly-lengthed droughts. Either way, this should make for an interesting September and October.